AMES, Oakes, a Representative from Massachusetts; born in Easton, Mass., January 10, 1804; attended the public schools and Dighton (Mass.) 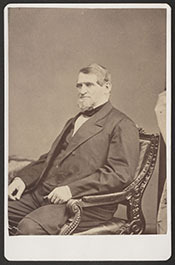 Academy; engaged in the manufacture of shovels in North Easton; member of the executive council of Massachusetts in 1860; elected as a Republican to the Thirty-eighth and to the four succeeding Congresses (March 4, 1863-March 3, 1873); was not a candidate for renomination to the Forty-third Congress in 1872; instrumental in accomplishing the construction of the first transcontinental railroad; censured by the House of Representatives on February 27, 1873, for "seeking to procure congressional attention to the affairs of a corporation in which he was interested," which was in connection with the Crédit Mobilier; in 1883 the legislature of Massachusetts passed resolutions of gratitude for his work and faith in his integrity and petitioned the United States Congress to extend him a like acknowledgment; died in North Easton, Mass., May 8, 1873; interment in Unity Cemetery. Papers: In the Allan Nevins Papers, 1912-1992, 96.5 linear feet. Correspondents include Oakes Ames. A finding aid is available in the repository and online. Papers: In the Ames Family and the Union Pacific Railroad Papers, 1861-1969, 3 linear feet. Correspondents include Oakes Ames. Papers: 1864, 1 item. A letter from Oakes Ames to Daniel W. Wetmore written on January 21, 1864. Papers: In the Ames Shovel Company Records, 1830s-1950s, 1500 linear feet. Persons represented include Oakes Ames. A finding aid is available in the repository. Papers: 1870, 1 item. A letter from Oakes Ames to Oliver Ames written on June 11, 1870. In the letter, Oakes Ames asks for Oliver Ames's preference regarding a bridge bill before the Congress; concerning a legal suit involving the Union Pacific RR; mentioning problems with Gen. Hammond. Papers: In the James M. Edmunds Correspondence, 1861-1866, 0.2 linear foot. Correspondents include Oakes Ames. Ames, Oakes. Defence of Oakes Ames against the charge of selling to members of Congress, shares of the capitol stock of the Credit Mobilier of America, with the intent to bribe said members of Congress. read in the House of Representatives, Feb. 25, 1873. [Washington? : N.p., 1873]. ------. Oakes Ames and the Credit mobilier. Boston: F. Wood, printer, . Chaffin, William Ladd. Discourse in memory of Oakes Ames. Easton: D. S. Hasty, book and job printer, 1873. Crawford, Jay Boyd. The Credit Mobilier of America; its origin and history, its work of constructing the Union Pacific Railroad and the relation of members of Congress therewith, by J. B. Crawford. Boston: C. W. Calkins, 1880. Reprint, New York: AMS Press, 1980.